"Someday I'll have to kill you." Director William Wyler's career spanned 6 decades, starting in the late 1920s. Earning fifteen nominations and winning three Academy Awards�®, Wyler is responsible for nearly 70 films, including Wuthering Heights, The Best Years Of Our Lives, Roman Holiday, Mrs. Miniver and Friendly Persuasion. The Big Country, the immediate precurser to his landmark roman epic, Ben-Hur (which would give Charlton Heston his only Oscar�®), tells the tale of a foreigner caught in the middle of a vicious battle over water rights, and the willingness of a man to fight for what he loves. James McKay (Gregory Peck) is an ex-sea captain from Baltimore who makes his way across the vast plains of the old west to marry Patricia Terrill (Carroll Baker), the daughter of a wealthy cattle baron. Steve Leech (Charlton Heston), the Terrill ranch foreman, is the first to meet Mr. McKay, and the rivalry between these two is apparent from their opening dialogue. McKay is a quiet gentleman, garbed in his eastern attire, while Leech is a hard working cowboy, none too impressed with this outsider who is oblivious to the way things are done in The Big Country. After meeting up with his fiancée and being introduced to her friend Julie Maragon (Jean Simmons), McKay and Patricia run into the Hannassey boys, blood rivals of the Terrills, who accost Mr. McKay with some drunken shenanigans, to which he takes a passive response, in contrast with Miss Terrill's willingness to shoot one of them. The Terrill family's impression of James McKay isn't enhanced when he declines to participate in a little hazing exercise involving a rogue horse. In response to the previous day's events, Pat's father, Major Henry Terrill (Charles Bickford) decides a little payback is due the Hannasseys, and while he and a group of his men ride to the Hannassey homestead to make their trouble and exact revenge, McKay quietly sets about his own coming to terms with the equine challenge he had earlier declined. The next evening is a time for celebration at the Terrell estate, with the engagement party for their daughter. As guests arrive, Julie Maragon is taken aside by the Major, who offers to buy her property, a piece of land known as The Big Muddy, a subject Julie is obviously tired of. The party is interrupted shortly thereafter when head of the clan, Rufus Hannassey (Burl Ives) makes an unwelcome appearance delivering a fiery speech and calling out Major Terrill. Their blood feud is now exposed, and the motives behind the acquisition of The Big Muddy begin to become clear, as it is the only watering hole in the area, vital to the cattle of each ranch. With each side wanting exclusive access to the property, the battle lines are drawn for control of The Big Country. The Big Country is an epic western with some nontraditional approaches. While blood feuds and showdowns are commonplace in the genre, having a cast of characters as morally ambiguous as this film is not. The two sides of the land dispute are equally matched, only their social status separates their shared desire to see the other suffer. Both Bickford and Ives (who won an Oscar® for his performance) excel in their roles. Gregory Peck's lead character, James McKay, is also unusual, not inclined towards overt bravado, yet willing to face adversity on his own terms. This characteristic is exploited by the script as a cause for his perceived weakness, but those who come to know him realize his true nature by the end of the film. Heston's role as Leech counters the moral stand of McKay, with his confrontational demeanor, though his character experiences growth during the film as well, and Chuck Connors also does a great job as the rebellious and not-too-bright Buck Hannassey. Although their parts are pivotal to the overall plot, Jean Simmons and Caroll Baker as the female leads are somewhat under developed compared to the males. From its trademark opening theme to its classic final confrontation, The Big Country is a film not to be missed by fans of the western genre. Image Transfer Review: The Big Country is presented in its 2.35:1 Technirama aspect ratio, though the opening credits seem pretty tight, leading me to believe this may be zoomed into the frame. For a 40-year-old film it looks in fairly good condition, though there are a number of flaws in the source, including dust and scratches, color fading and unnatural color shifts. The different reels tend to suffer different anomalies. The opening reel has a fair amount of horizontal scratches present, while the final reel exhibits a subtle strobing effect. Colors are somewhat muted, though black level is relatively consistent, with fair midshadow detail, and some scenes do tend towards looking overly dark. The image is somewhat soft overall, though the lack of edge enhancement is welcome. There are some compression issues present, most noticable on scenes with a lot of ground detail. Aliasing is present in horizontal patterns in places. Despite these issues, the film does look quite acceptable, just not up to what one would expect from a properly restored film. Audio Transfer Review: Two-channel mono is presented cleanly, with no sign of distortion. Frequency range is limited, especialy in the low end, which is to be expected for a film of this vintage. A couple of drop-outs here and there, but overall this sounds fine. A French track is also available. Extras Review: While having the film in anamorphic widescreen is certainly the highlight of this package, it is too bad that MGM didn't see fit to include any of the extras that were available on the film's previous laserdisc edition, which included a promotional film and interviews with Peck and Heston, plus stills and a lecture on the film's soundtrack. We don't even get any of the production essay included in that package; instead we get the film's trailer (at least presented widescreen, though not anamorphic) and MGM's now standard single sheet insert, featuring a chapter listing opposite the DVD's nonoriginal cover artwork. That said, I wouldn't want to see this film with any more compression applied to it, so perhaps there were good reasons for keeping the extras sparse, though 16 chapter stops for a two and a half hour film is a might thin. On a technical note, the disc is not readable on my Mac DVD player. 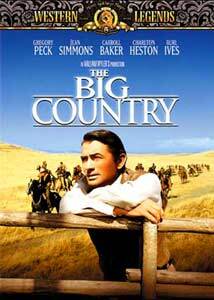 Director William Wyler's cinematic style in The Big Country emphasizes its title throughout the picture, with the vastness of the surroundings dwarfing the action in several key sequences. Highly underrated, The Big Country delivers some powerhouse performances from its entire cast, and belongs in any serious western film collection. While this release is short on supplements, the main feature is adequately presented, though far from reference quality. Recommended.